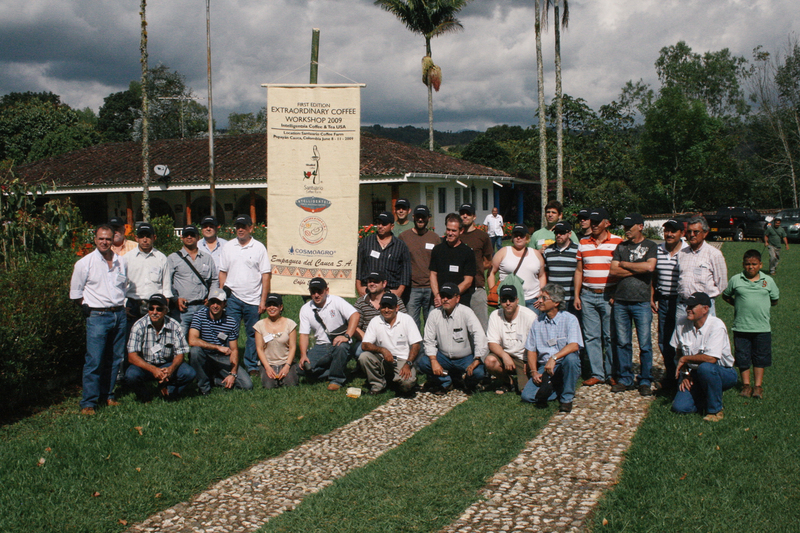 The first Intelligentsia Extraordinary Coffee Workshop was held in 2009 in Cauca, Colombia, on Camilo Merizalde’s Finca Santuario. It was something like an intimate version of Woodstock for coffee: a spontaneous gathering on a remote farm, lacking in foresight, infrastructure and creature comforts, but exuberant, inspirational and unforgettable. The host, Camilo Merizalde, recalls that he casually mentioned to his wife that he was planning to have some friends over to the farm for a few days. When she asked how many, he did a quick mental calculation, and suggested it would be between 40 and 50! The inspiration for that original gathering came from our Vice President of Coffee Geoff Watts, who by then had spent more than five years tirelessly traveling the globe, visiting each of our Direct Trade partners as many as three or four times a year. He was using his camera and laptop to capture images and descriptions of things that informed him, inspired him, or both, with a special focus on things that seemed to be unique to a specific place. Using the images and notes on his laptop as pollen, Geoff became a kind of coffee bee who carried ingenious ideas and promising practices from one place to another: effective agronomic practices, creative approaches to harvesting, innovations in post-harvest infrastructure and processing, and much more. Over time, his wings started to tire, and he wondered whether there was a better approach to cross-pollinization, a more effective way to foster the exchange of ideas and practices across the sprawling Direct Trade network he was building. The answer was ECW. Since that first gathering on Camilo’s farm in Colombia back in 2009, ECW has traveled to El Salvador (2010), Los Angeles (2011), Chicago (2012), Brazil (2013), Ethiopia (2014), Guatemala (2015) and Costa Rica (2016). Over the coming days, I will post images and reflections from past ECW events as we count down to the start of ECW 2017, which be held 25-29 September at our Roasting Works in San Francisco. Subscribe to the Intelli Sourcing Sessions podcast on iTunes or Soundcloud and never miss another Intelligentsia podcast.